Cities: Capital — Sarajevo (est. pop 387,876); Banja Luka (220,407); Mostar (208,904); Tuzla (118,500); Bihac (49,544). Nationalities: Bosniak (Bosnian Muslim), Bosnian Croat, Bosnian Serb. Education: 9 years of mandatory primary school, 3-4 years of secondary school (vocational or liberal arts), 3 years of undergraduate study and 2 years of graduate study at universities (depending on major). In Bosnia and Herzegovina, there are 1,089 primary schools with 359,902 students, 289 secondary schools with 148,100 students, and 20 universities with 139 faculties plus 10 academies and 4 religious faculties with 105,488 students. The main public universities are in larger cities (Sarajevo, Mostar, Banja Luka, Tuzla, Bihac, Zenica), and there are a number of private institutions of higher education. Adult literacy rate — male 94.1%, female 78.0%. Health: Infant mortality rate (2005 est.) — 21.05 deaths/1,000 live births. Life expectancy (2005 est.) — male 70.09 years, female 75.8 years. Branches: Executive: Chairman of the Presidency and two other members of three-member rotating presidency (head of state), Chairman of the Council of Ministers (head of government), Council of Ministers (cabinet). Legislative — bicameral parliamentary assembly, consisting of a House of Representatives and a House of Peoples. Judicial — Constitutional Court; Court of Bosnia and Herzegovina, which has jurisdiction over war crimes, terrorism, human trafficking, and organized and serious economic crimes; Ministry of Justice. Subdivisions: Two Entities: Federation of Bosnia and Herzegovina (divided into 10 cantons) and Republika Srpska. In accordance with Annex 2, Article V, of the Dayton Peace Agreement (http://www.ohr.int/dpa/default.asp?content_id=380) that left the unresolved status of Brcko subject to binding international arbitration, an Arbitration Tribunal was formed in mid-1996. On March 5, 1999, the Tribunal issued its Final Award. The Final Award established a special District for the entire pre-war Brcko Municipality (Opstina), under the exclusive sovereignty of Bosnia and Herzegovina. The territory of the District belongs simultaneously to both Entities, the Republika Srpska and the Federation, in condominium. Amendment I to the BiH constitution, passed in March 2009, codifies this status in the constitution. In accordance with the Final Award, the District is self-governing and has a single, unitary, multiethnic, democratic Government; a unified and multiethnic police force operating under a single command structure; and an independent judiciary. The District Government exercises, throughout the pre-war Brcko Municipality, those powers previously exercised by the two Entities and the former three municipal governments. The Brcko District is demilitarized. Political parties: Party of Democratic Action (SDA); Social Democratic Party (SDP); Party for Bosnia and Herzegovina (SBiH); Alliance for a Better Future of BiH (SBB-BiH); Bosnian Patriotic Party (BPS); National Democratic Union (DNZ); Bosnian Party (BOSS); Civil Democratic Party (GDS); Liberal Democratic Party (LDS); Social Democratic Union (SDU); Croatian Democratic Union of BiH (HDZ-BiH); Croatian Democratic Union-1990 (HDZ-1990); People's Party of Work for Progress; Croatian Party of Rights-Djapic/Jurisic (HSP-D/J); Christian Democratic Union of BiH (HKDU); Croat Peasants' Party-New Croat Initiative (HSS-NHI); Croatian Peoples' Union; Nasa Stranka (NS); Serbian Democratic Party (SDS); Alliance of Independent Social Democrats (SNSD); Socialist Party (SP); Party for Democratic Progress (PDP); Democratic Party (DP); New Socialist Party (NSP); Serb Radical Party of the Republika Srpska (SRS-RS); Serb Radical Party-Dr. Vojislav Seselj (SRS-VS); Democratic Peoples' Alliance (DNS). GDP real growth rate (2009 est. ): -3.2%. Nominal GDP per capita: $4,700. Inflation rate (2010 est. ): 2.5%. Average monthly net salary (2010): $550. Natural resources: Hydropower, coal, iron ore, bauxite, manganese, forests, copper, chromium, lead, zinc, cobalt, nickel, clay, gypsum, salt, sand, forests, alumina. Agriculture: Products: wheat, corn, fruits, vegetables, livestock. Industry: Steel, aluminum, minerals, vehicle assembly, textiles, tobacco products, wood furniture, explosives, munitions, aircraft repair, domestic appliances, oil refining, cement and concrete. Trade (2010 Central Bank figures): Exports — $4.4 billion. Imports — $8.4 billion. The three constituent peoples of Bosnia and Herzegovina are Bosniaks, Serbs, and Croats, and languages are Bosnian, Serbian, and Croatian. Religions include Islam, Serbian Orthodoxy, Roman Catholicism, Judaism, some Protestant sects, and some others. For the first centuries of the Christian era, present-day Bosnia was part of the Roman Empire. After the fall of Rome, it was contested by Byzantium and Rome's successors in the west. Slavs settled the region in the 7th century. The medieval kingdom of Bosnia emerged in the 12th century and ended in 1463, when Ottoman Turks conquered the region. During Ottoman rule, many Bosnians converted from Christianity to Islam. Bosnia was under Ottoman rule until 1878, when the Congress of Berlin transferred administrative control to Austria-Hungary. 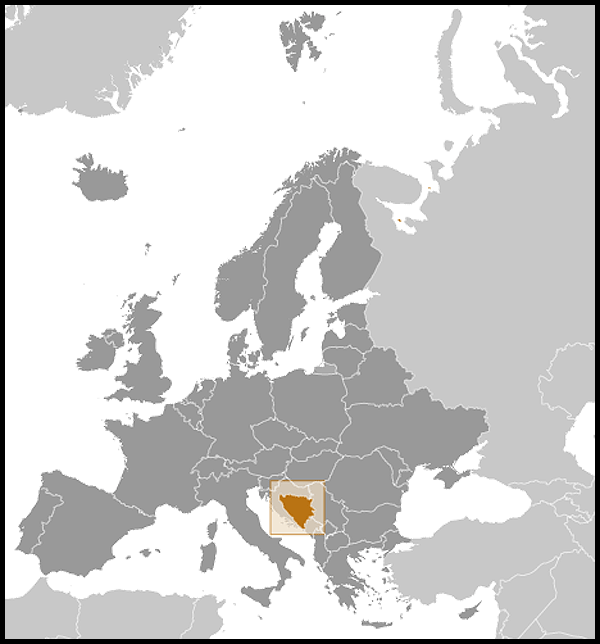 Austria-Hungary annexed Bosnia in 1908. While those living in Bosnia came under the rule of the Austro-Hungarian Empire, South Slavs in Serbia and elsewhere were calling for a South Slav state. World War I began when Serb nationalist Gavrilo Princip assassinated the Archduke Franz Ferdinand in Sarajevo. 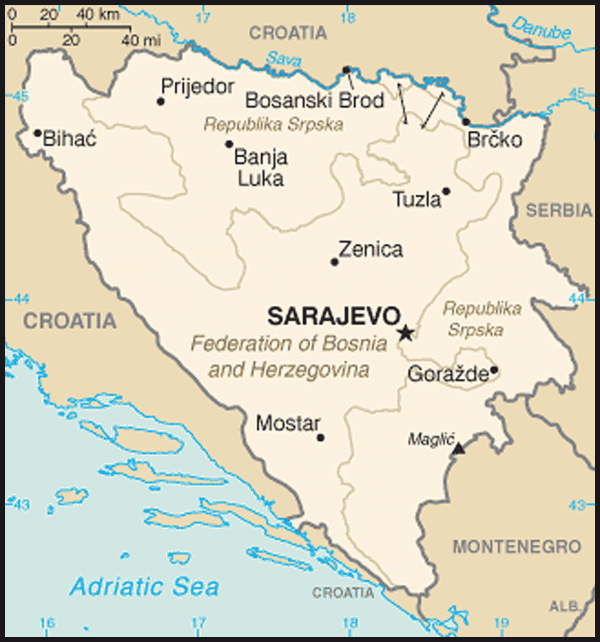 Following the Great War, Bosnia became part of the South Slav state of Yugoslavia, only to be given to the Nazi-puppet state, the Independent State of Croatia (NDH) during World War II. Many atrocities were committed against Jews, Serbs, and others who resisted the occupation from 1941-45. The end of the war saw the establishment of a Communist, federal Yugoslavia under wartime leader Josip Broz Tito, with Bosnia and Herzegovina as one of six republics in the Yugoslav federation. After Tito died in 1980, Yugoslavia's unraveling was hastened by Slobodan Milosevic's rise to power in 1986. Milosevic's embrace of Serb nationalism led to intrastate ethnic strife. Slovenia and Croatia both declared independence from Yugoslavia in June 1991. By late September 1991, Bosnian Serb Radovan Karadzic's Serbian Democratic Party (SDS) had declared four self-proclaimed "Serb Autonomous Regions (SAO)" in Bosnia. In October 1991, the Bosnian Serbs announced the formation within Bosnia of a "Serbian Republic of Bosnia-Herzegovina" that would have its own constitution and parliamentary assembly. In January 1992, Radovan Karadzic publicly proclaimed a fully independent "Republic of the Serbian People in Bosnia-Herzegovina." On March 1, 1992, the Bosnian Government held a referendum on independence. Bosnia's parliament declared the republic's independence on April 5, 1992. However, this move was opposed by Serb representatives, who had voted in their own referendum in November 1991 in favor of remaining in Yugoslavia. Bosnian Serbs, supported by neighboring Serbia, responded with armed force in an effort to partition the republic along ethnic lines. Recognition of Bosnia and Herzegovina's independence by the United States and the European Community occurred on April 6-7, and Bosnia and Herzegovina was admitted to the United Nations on May 22, 1992. In March 1994, Muslims and Croats in Bosnia signed an agreement creating the Federation of Bosnia and Herzegovina, ending a period of Muslim-Croat conflict. The conflict with the Bosnian Serbs continued through most of 1995. Many atrocities were committed, including acts of genocide committed by members of the Army of Republika Srpska in and around Srebrenica in July 1995, where approximately 8,000 Bosnian Muslim men and boys were killed. The conflict ended with the November 21, 1995 Dayton Peace Agreement, which was formally signed on December 14, 1995 in Paris. Radovan Karadzic and Ratko Mladic, the political and military leaders of the Bosnian Serbs, were indicted by the International Criminal Tribunal for the Former Yugoslavia (http://www.icty.org/) in The Hague in July 1995 on charges of genocide and crimes against humanity stemming from their role in crimes against civilians throughout Bosnia and Herzegovina culminating in the Srebrenica massacre. Karadzic was apprehended and transferred to the ICTY in The Hague by Serbian authorities on July 21, 2008. Mladic was apprehended in Serbia on May 26, 2011 and transferred to The Hague on June 1, 2011. Bosnia and Herzegovina today consists of two Entities — the Federation of Bosnia and Herzegovina (FBiH), which is largely Bosniak and Croat, and the Republika Srpska (RS), which is primarily Serb. In July 2000, the Constitutional Court of Bosnia and Herzegovina rendered a decision whereby Bosniaks, Croats, and Serbs are recognized as constituent peoples throughout the territory of Bosnia and Herzegovina. In March 2002, this decision was formally recognized and agreed on by the major political parties in both Entities. The most recent national elections took place in October 2010, electing new state presidency members; state, Entity, and cantonal parliaments; and the RS presidency. The BiH presidency was sworn in on November 10, 2010. The RS government was formed in December 2010, and the Federation government was formed in March 2011. Talks are ongoing to form a state-level government. The next municipal elections are scheduled to occur in 2012, and the next general elections will take place in 2014. In October 2008, Bosnia and Herzegovina held municipal elections, where mayors and members of municipal assemblies were directly elected (in all municipalities except Mostar and Brcko District). The international community retains an extraordinary civilian and military presence in Bosnia and Herzegovina (BiH) stemming from the Dayton Peace Accords. The Dayton Accords created the position of High Representative, an international official charged with overseeing implementation of the civilian aspects of the agreement. The current High Representative (since March 2009) is Austria's Valentin Inzko (http://www.ohr.int/). In December 1995, NATO deployed a 60,000-troop Implementation Force (IFOR) to oversee implementation of the military aspects of the peace agreement. IFOR transitioned into a smaller Stabilization Force (SFOR) in 1996. With the end of the SFOR mission in December 2004, the European Union (EU) assumed primary responsibility for military stabilization operations. Approximately 1,600 EU troops remain deployed in Bosnia (http://www.euforbih.org/). NATO maintains a small headquarters operation with responsibility to assist with defense reform and efforts against persons indicted for war crimes and counterterrorism. General Government Framework Information and Information Regarding the President and the Cabinet. Under the provisions of the Dayton Peace Accords, the Entities have competencies in areas such as taxation, except indirect taxation, business development, and general legislation. Entities and cantons control their own budgets, spending on infrastructure, health care, and education. Ongoing reforms have led to the creation of a single, multi-ethnic military under state-level command and control to replace the previous Entity-based institutions and a state-level Indirect Taxation Administration (ITA) that is responsible for the implementation of a nationwide value-added tax (VAT), revenues from which are collected in the "Single Account." The Single Account funds the governments of the state of Bosnia and Herzegovina, the country's foreign debt, the two Entities, and Brcko District. Customs, which had been collected by agencies of the two Entities, also are now collected by a new single state customs service. Presidency. The Chairmanship of the Presidency in Bosnia and Herzegovina rotates every 8 months among three Presidency members (Bosniak, Serb, Croat), each elected for a 4-year term. The three members of the Presidency are directly elected (the Federation votes for the Bosniak and Croat, and the Republika Srpska for the Serb). The Presidency is responsible for:Conducting the foreign policy of Bosnia and Herzegovina;Appointing ambassadors and other international representatives, no more than two-thirds of whom may come from the Federation;Representing Bosnia and Herzegovina in European and international organizations and institutions and seeking membership in such organizations and institutions of which it is not a member;Negotiating and, with the consent of the Parliamentary Assembly, ratifying treaties of Bosnia and Herzegovina;Executing decisions of the Parliamentary Assembly;Proposing, upon the recommendation of the Council of Ministers, an annual budget to the Parliamentary Assembly;Reporting as requested, but no less than annually, to the Parliamentary Assembly on expenditures by the Presidency;Coordinating as necessary with international and non-governmental organizations in Bosnia and Herzegovina;Exercising command and control over the Armed Forces of Bosnia and Herzegovina in peacetime, crises, and war, and;Performing such other functions as may be necessary to carry out its duties, as may be assigned to it by the Parliamentary Assembly, or as may be agreed by the Entities. The House of Peoples includes 15 delegates, two-thirds of whom come from the Federation (5 Croats and 5 Bosniaks) and one-third from the Republika Srpska (5 Serbs). Nine members of the House of Peoples constitute a quorum, provided that at least three delegates from each ethnic group are present. Federation representatives are selected by the House of Peoples of the Federation, and Republika Srpska representatives are selected by the Republika Srpska National Assembly. The House of Representatives is composed of 42 members, two-thirds elected from the Federation and one-third elected from the Republika Srpska. Federation representatives are elected directly by the voters of the Federation, and Republika Srpska representatives are directly elected by Republika Srpska voters. Judiciary. Bosnia and Herzegovina has a multi-layered and decentralized judicial system consisting of 14 Justice Ministries and numerous courts. The FBiH has the Constitutional Court of FBiH, the Supreme Court of FBiH, 10 cantonal courts, and municipal courts, as well as minor offense courts. The RS has the Constitutional Court of Republika Srpska, the Supreme Court of Republika Srpska, district courts, and basic courts, as well as minor offense courts. Brcko District also has its own courts. The Court of Bosnia and Herzegovina (State Court), established by December 8, 2000 legislation, has criminal, administrative, and appeals departments and jurisdiction only over specific types of crimes, such as war crimes, financial crimes (e.g., official corruption and human trafficking), and crimes against the State (e.g., treason and terrorism). Unlike the BiH Constitutional Court, which is the final authority on questions of constitutionality, the State Court operates alongside, not above, the Federation and RS Supreme Courts. The Constitutional Court of Bosnia and Herzegovina was first established in 1964. It decides any constitutional dispute that arises between the Entities or between Bosnia and Herzegovina and an Entity or Entities. The BiH Constitutional Court also has appellate jurisdiction over issues related to the constitution arising out of a judgment from another court in the country, and jurisdiction over issues referred to it by another court concerning compatibility with the constitution, the European Convention for Human Rights and its associated protocols, laws of BiH, or international law pertinent to a court decision. The BiH Constitutional Court is composed of nine members: four are selected by the House of Representatives of the Federation, two by the Assembly of the Republika Srpska, and three by the President of the European Court of Human Rights after consultation with the Presidency. Bosnia and Herzegovina maintains an embassy (http://www.bhembassy.org/) in the United States at 2109 E Street NW, Washington, DC 20037 (tel. : 202-337-1500; fax: 202-337-1502). Bosnia and Herzegovina was among the poorer areas of the old Yugoslav Federation and remains one of the poorer countries in Europe. For the most part, agriculture remains in private hands, but farms have been small and inefficient, and net food imports increased dramatically in the aftermath of the 1992-1995 war. Many industries are still overstaffed, reflecting the legacy of the centrally-planned economy, though limited privatization has improved efficiency in certain sectors. Under Tito, military industries were widespread in Bosnia, which hosted a large share of Yugoslavia's defense plants. During the war, 3 years of interethnic strife damaged or destroyed much of the economy and infrastructure in Bosnia, caused the death of about 100,000 people, and displaced half of the population. Considerable progress has been made since peace was reestablished following the Dayton Accords. Still regarded as a transition economy, Bosnia and Herzegovina (BiH) sees the long-term goal of EU membership as a driver to further economic growth and development. Due to Bosnia and Herzegovina's strict currency board regime, which links the Konvertibilna Marka (BAM or KM) to the Euro, inflation has remained relatively low and, as a result, the BAM is one of the most stable currencies in Southeast Europe. The banking sector has been fully reformed, with a significant inflow of foreign banks (foreign ownership currently stands at 85% of the banking sector) providing businesses with easier access to capital and a better range of banking services. Lending has slowed significantly since 2008. Per capita GDP in 2009 was U.S. $4,700, with a total nominal GDP of approximately U.S. $17.1 billion (source: World Bank). While official unemployment is approximately 40%, "unofficial" estimates of unemployment that include the large gray economy are approximately 18%-22%. Bosnia and Herzegovina's most immediate task remains economic revitalization. The country needs meaningful progress in structural reforms to strengthen the basis for sustained, private sector-led growth. In order to improve the business climate, private sector growth — especially small and medium enterprises (SMEs) — and foreign direct investment (FDI) acceleration are needed to spur increased economic growth and job creation. Creating a single economic space will be key to attracting increased foreign investment. Privatization has been slow, and unemployment remains high. BiH's top economic priorities are: acceleration of EU integration; strengthening the fiscal system; public administration reform; World Trade Organization (WTO) membership; and securing economic growth by fostering a dynamic, competitive private sector. To date, work on these priorities has been inconsistent. The country has received a substantial amount of foreign assistance and will need to demonstrate its ability to implement its economic reform agenda in order to advance its stated goal of EU accession. In 2009, Bosnia and Herzegovina undertook an International Monetary Fund (IMF) standby arrangement, necessitated by sharply increased social spending and a fiscal crisis precipitated by the global economic downturn. The program aims to reduce recurrent government spending and to strengthen revenue collection. The implementation of the Dayton Accords of 1995 has focused the efforts of policymakers in Bosnia and Herzegovina, as well as the international community, on regional stabilization in the former Yugoslavia. However, donor resources for Bosnia and Herzegovina have diminished due to competing assistance priorities elsewhere in the region and globally. Bosnia and Herzegovina's relations with its neighbors Croatia, Montenegro, and Serbia have been fairly stable since the signing of Dayton in 1995. The U.S. role in the Dayton Accords and their implementation has been key to successes in Bosnia and Herzegovina. Since the Dayton Accords were signed, over $15 billion in foreign aid has moved into Bosnia and Herzegovina, approximately $1.38 billion of it coming from Support for East European Democracy (SEED) funds. U.S. Government assistance, managed by the U.S. Agency for International Development (USAID), as well as the Departments of State, Justice, Defense, Treasury, and Commerce, have been crucial to the redevelopment of Bosnia and Herzegovina. The U.S. Government currently has programming in the following areas: economic policy reform and restructuring; private sector development; fostering democratic reforms in local government, civic education, and civil society; rule of law, including support to law enforcement, judicial, and prosecutorial institutions; and security sector assistance. Bosnia and Herzegovina is a member of the United Nations (1992); International Monetary Fund (IMF) (1992), World Bank (1995), Organization for Security and Cooperation in Europe (OSCE) (1992); and the Council of Europe (2002). It also participates in regional cooperation through the Regional Cooperation Council (RCC), Central-European Initiative (CEI), Southeast Europe Co-operation Initiative (SECI), Southeast Europe Co-operation Process (SEECP), Adriatic-Ionic Initiative (AII) and others. The 1992-95 war in Bosnia and Herzegovina was ended with the crucial participation of the United States in brokering the 1995 Dayton Accords. After leading the diplomatic and military effort to secure the Dayton agreement, the United States has continued to lead the effort to ensure its implementation. The United States maintains command of the NATO headquarters in Sarajevo. The United States has donated hundreds of millions of dollars to help with reconstruction, humanitarian assistance, economic development, and military reconstruction in Bosnia and Herzegovina. The U.S. Agency for International Development (USAID (http://www.usaid.gov/locations/europe_eurasia/countries/ba/index.html) has played a large role in post-war Bosnia and Herzegovina, including programs in economic development and reform, democratic reform (media, elections), infrastructure development, and training programs for Bosnian professionals, among others. Additionally, there are many non-governmental organizations (NGOs) that have likewise played significant roles in the reconstruction. The U.S. Embassy in Bosnia and Herzegovina is at 1 Robert C. Frasure Street, 71000 Sarajevo (tel. : +387 33 704-000; fax: 387 33 659-722; website: (http://sarajevo.usembassy.gov/). The Embassy can be contacted for emergency or other information.